Business moves fast. And when you need a new car… truck.. or piece of equipment to help your business grow, you usually need it ASAP… not in two-weeks time when your bank finally approves the loan. At Leasecorp we can help finance AND settle your next business purchase fast. In most cases, within 24 hours, and at a discount usually reserved for huge, bulk purchasers. While our loans are approved fast and at some of the very best rates in Australia, that’s not all you get when you select Leasecorp for your next business loan. 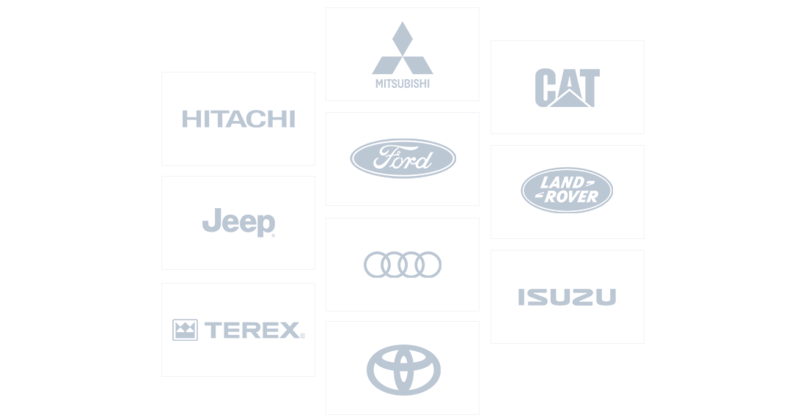 We also have discount purchase agreements with some of the world’s biggest brands, including Jeep, Ford, Mitsubishi, Audi, Landrover, Rolls-Royce, Hitachi, Isuzu, Terex, Tadano, and dozens more. In short, if you’re looking to buy a car, truck, or piece of equipment, we can probably get it for you cheaper and faster that just about anyone in Australia (we also specialise in machinery as well!). Getting a loan through Leasecorp is an easy, personal service. We won’t offer you a cookie-cutter, one-size-fits-all loan that isn’t right for your situation. Instead, we’ll look at your needs and find a way to get you the exact loan you need at a great rate you can afford. Just imagine. In as little as 24 hours from now you could be rolling out of the lot in a gleaming new car. Or fitting out your workshop with a brand-new piece of machinery that could double your productivity. Keep your funds liquid and profits ticking over with our easy loan service. Save time with our traditional approach to banking. Don’t run around from office to office arranging your loan. We’ll bring all documents to your home or workplace, making your next purchase a stress-free, fast process. Slash thousands from your car or equipment purchase. Our relationships with Australia’s largest dealers ensures you get the very best price on a huge range of brands. If you’re not sure if we deal with a particular brand or manufacturer, just ask! Benefit from 27 years of buying experience. We’ve been buying plant equipment, heavy machinery and all sorts of motor vehicles for a LONG time. We know how to spot a good deal and we’ll use all our experience to make sure you’re well looked after. I have used David & his team at Leasecorp for several years for both commercial equipment & motor vehicle finance for my business. Professional & prompt service. Highly recommended. "Leasecorp has saved us thousands over the years, in money and time. The team is extremely professional and unlike banks knows our industry inside and out. They hand delivered all paperwork and took care of everything, five stars"
"David and the team are great! Found a cheaper excavator for us, organised delivery and had our loan approved all within three days; I would highly recommend them." "True experts! Leasecorp helped us sell three of our old tractors and negotiated a better deal on our new ones. They have no problem driving 5+ hours to see us, always a pleasure to deal with, service is fast, reliable and experienced." "The service has been of the highest quality and very personalised which can be very rare in today's business environment. Thank you and looking forward to a long relationship with Leasecorp." I have used Leasecop Finance numerous times for both equipment and motor vehicle finance and always found them to be professional and competitive. They provide a personal and speedy service every time. Highly recommend. 'My dealings with Leasecorp has set a new benchmark in relation to my expectations of customer service and professionalism. I now have a new standard to expect from other people and businesses I deal with. We can't talk highly enough of Dave and his team at Leasecorp Finance. Very approachable, knowledgeable, easy process for approval. Highly recommended. Very pleased with our recent dealings with Leasecorp Finance, in particular, David and Michael. The way the Leasecorp team operates is second to none. Would definitely use them for our future financing and leasing needs. "We have used Leasecorp for many years, the service is always outstanding, they truly go above and beyond, Thanks, guys!" We’d love to arrange your next business loan and find you a great deal on the piece of machinery or vehicle you need to buy. BUT before you do anything, we need to talk. There’s only one way to find out if we can help you save thousands off your next purchase, and that is to spend some time understanding exactly what you need and figuring out how to get it at the very best price. Once we’ve spoken – with your permission – we’ll launch into finding you a great loan, and if you want, a tremendous deal on the vehicle or piece of equipment you’ve had your eye on. Of course, if you talk to us and we can’t help you, OR you feel like we’re not a good fit, that’s OK too. But as you’ll read below, our customers tend to love our great service and fast approval times. All you need to do to get started is click or tap the button below that says “Find Out More” and then fill in some details. Once they are sent through one of our friendly, expert staff will be in touch ASAP to find out more about what you need! And secure instant, no-obligation approval – if you decide to go ahead. Once again, this is an obligation-free chat. So, please go ahead and fill your details out now by clicking the ‘Find Out More’ button below. Do You Want Instant Approval for Your Loan Right Now? Fill out your details below and we will be in touch with you shortly!